Find a sheet metal fabrication shop with the equipment capable of forming a sheet of aluminum into a cover. The profile doesn’t have to be a spot-on copy of the Lexan cover but a similar one that fits well at surrounding the light fixtures and matches up properly to the bumper and front facia. Since the OEM headlights on an LXi are not very good for night driving, it may also be a good opportunity to upgrade your headlights to a better HID type and design the new covers to fit properly around them. Regarding your question about comparing the Prevost to an LXI, I’m pleased with the Marathon. But I really liked both LXi(s) that I owned. My reason for switching to a Prevost really had nothing to do with the quality of the LXi for they were both built well and were quality coaches. But, as you are now experiencing, there is no factory support or field service centers for parts, service and repair for a Wanderlodge. This has driven their market value down to extremely low levels and made the purchase of a Wanderlodge an absolute bargain for the person willing to deal with the difficulties of finding parts and keeping an orphaned coach repaired & maintained. I need a coach that I can get experienced and knowledgeable service and repair done by someone other than myself. Prevost and Marathon provide nationwide service centers for all their coaches regardless of the coach’s age. Their service and repair costs are not cheap. I still do the minor repairs to my coach but after many years of doing most of the maintenance & repairs myself, I’m happy to let someone else do the heavy lifting. I still have had no luck finding the headlight. Can someone please send me some pictures of the aluminum replacements? Does anyone know of "junk" yards for rv's ? Does anyone know if a 3D printer that would be capable of making a cover? Will appreciate any help. 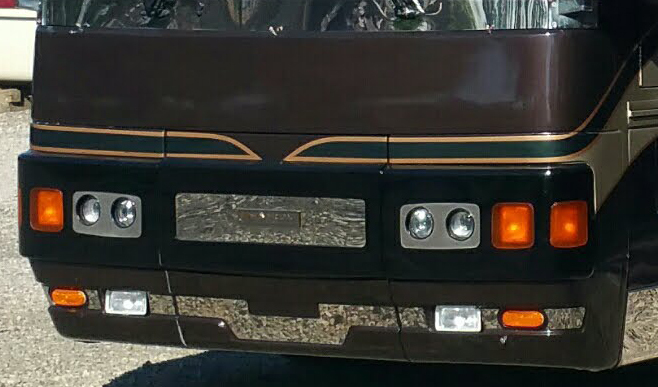 I am planning on getting the coach detailed and some scuff marks taken care of and would sure like to have it look complete with both headlight covers. Arrowhead Plastic Engineering are the folks who did all the fiberglass manufacturing for the LXi. I bet they also did the lexan headlight surrounds. It wouldn't hurt to give them a call. Coach Parts (Dan Hartley) might be able to supply the fiberglass units, which might be a viable option. My understanding is that Arrowhead needs a fairly large order to mfg the originals. These covers came out on the LTC-40 transit bus, then used on the LXI, M380/450. Good luck with your quest, and let us know. Thanks all. I have contacted Dan Hartley and he does not have any at this time. Thanks for the info on Arrowhead - I will contact and let you know what I found. A fellow that lurks here says Arrowhead mfg fiberglass parts for Wanderlodge, but not the headlight covers. I have been trying to trace down the many leads - no luck yet. I will post whatever information I find and hopefully everyone else does the same. the oem are different left to right and not a good fit either. I ended up using a screw and button cap to keep them on and melted some tie wire on the back to affix. I removed the lexan and cut some scrap stainless steel. used 1/4 airline split outside of the radius with a blade to cover up my edge. if you are looking for the black cover the fiberglass would be the way to go and just have it refit by a good fiberglass shop.